We use several reoccurring phases at Build Your Library. 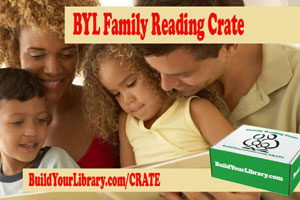 If you have purchased one of our new Family Reading crates, you will find them printed on the sides of the box. “Read everyday.” “I love books.” Our catch phrase “Building young minds, One book at a time…” Even our name “Build Your Library” implies a two-fold reading themed meaning, building your home library by filling in with good literature and building a vast library of personal knowledge in the heads of your children. With each curriculum level of Build Your Library, you and your child will read dozens of assigned books from the topics covered throughout the year. But it doesn’t have to stop there. Many times you will find that your children will long to delve deeper into a particular subject matter. Which is one of the best things about homeschooling your child, the flexibility and time to do just that! 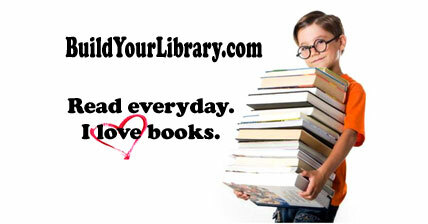 Just like you probably have favorite authors, perhaps Stephen King, Neil Gaiman or George R.R. Martin, and you read as many of their books as you can get your hands on… the same can be true for your children. If you read an assigned book that your child particularly likes, look up additional works by the same author, just for fun. One of our favorite authors is Kate DiCamillo, and we use The Tale of Despereaux in BYL Level 1, The Miraculous Journey of Edward Tulane in Level 2 and Because of Winn-Dixie in Level 4. But I’m sure your local public library has several other of her wonderful works available to check out, such as Flora & Ulysses or The Tiger Rising. Another favorite author in our house is Roald Dahl. His books are delightfully silly and thought provoking. You’ll read Charlie and the Chocolate Factory in BYL Level 1, and from there you might want to check out Matilda, James and the Giant Peach, The Twits, or The Witches. Anytime a book seems to particularly speak to your child, search out more of that author’s work. They may discover another new favorite! I’m sure there are many assigned topics that become instant hits, prompting many further discussions and stacks of library books. Dinosaurs, sharks, knights and mythology have always been prolific and productive rabbit trails. If you have been following our blog posts here in the past, you know that even with over 50-60 books on dinosaurs in our personal home library, we have still carried several piles of dinosaur books from the public library at the request of our one-time aspiring paleontologist. And all of these borrowed books were actively flipped through, read and prompted many newly learned facts to be shared at the dinner table. There are several fascinating time periods that get too briefly covered throughout your children’s years of schooling. The ones that pique the most interest make wonderful segues into inspiring further research. We have found many popular time periods throughout our homeschooling studies that our children just begged to be covered more thoroughly. But one of our personal favorites is when we can pull some family genealogical tie ins into a historical time period. My husband has been researching our family tree for many years, so we have a rather extensive set of branches that we can trace to many significant historical events. Our children have 8th great grandfathers in the Revolutionary War, 4th great grandfathers in the Civil War, 4th great grandparents living during the Irish Potato famine, and even 13th great grandparents traced back to the Mayflower. It comes up every year on TV watching the Peanuts (Thanksgiving)/Mayflower Voyage when they name our ancestors landing at Plymouth Rock with Charlie Brown. It doesn’t even have to be that specific. If you know you have French ancestry, you can expect that certain events around the time of Napoleon must have occurred within the lifetimes of not-too-distant relatives. Perhaps that could spawn a desire to research your own family history, or at least inspire a more personal connection to certain historical events directly relating to cousins several generations back. Educational inspiration can come in many forms. While reading can be an exceptional learning tool on its own, I think that collaborating with other media sources can offer an even deeper understanding and richer illustration of topics. With YouTube, Netflix, Amazon Prime Videos or your cable on-demand offerings, you should be able to find a vast assortment of (mostly) historically accurate movies and documentaries. We have had several instances when after we read through some literature, watching a visual representation on TV prompted many discussions on “Oh, that’s what the streets of medieval London or the Native American Indian settlement looked like…” Which in turn, can spur seeking out additional books to be read with an newly enlightened outlook to the conditions and hardships that occurred. It can also be beneficial to giving your child pegs in which to remember when and how things happened and are related. An example from my own experiences – I adored the movie Lady Jane as a girl. It wasn’t until I’d seen the movie a half dozen times that I decided to learn more and found out how incredibly inaccurate the film was. I ended up devouring books, movies and documentaries about the Tudor family and was able to firmly place the events of the time period in my mind… all starting with that one movie. Build Your Library strives to do just that, fill your house with books, and fill your child’s mind with libraries of knowledge, But we are also hoping to help foster a love of reading and a quest for learning. Using the assigned books and topics in the Build Your Library curriculum, Unit Studies or Family Reading Crates are great springboards into reading and learning more and more. 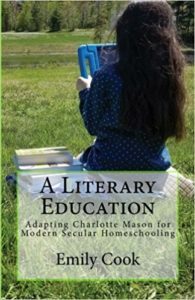 You can find many additional book suggestions contained within each of the BYL Level Instructor Guides, my book A Literary Education: Adapting Charlotte Mason for Modern Secular Homeschooling, other blog posts here or in our Family Reading Crates.